Recently I passed on an iPhone 4 to my son. He’s 10 years old and he was absolutely dying for a phone. Like all my gadgets it was crammed with apps, pictures, music, videos and more. Almost immediately he was out of memory. He wanted to have more space and i said you need to delete some apps. Watching him was a beautiful thing. He went through his deck like a madman. Boring. Delete. Don’t want it. Delete. Why do I have this? Delete. I hate this game. Delete. Outgrown. Delete. Delete. Delete Delete. It was amazing. 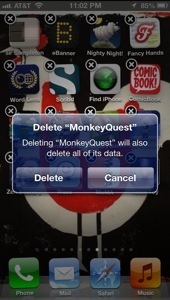 In just a few minutes he had effortlessly and ruthlessly deleted 2GB of apps. No sentiment. No wavering. Just business. I painstakingly debate whether to trash apps and anything else that is overloading my phone. With hundreds of games, services, social networks and utilities all mostly losing the battle for my attention, why is it so easy to add more stuff and so hard to lose it? It’s just stuff, but the emotional and intellectual attachment is strong. Do I need more memory or just the execution-style app killing skills of my son? Maybe I can implement his process to clean up my iPhone, my iPad and maybe a few junk drawers as well. In these days of app, email, text, music, video and information overload and the push to unplug and unclutter we can learn a powerful lesson from a 10 year old.